Ultimate Master is our most popular carpet cleaning powder. It is an advanced all-in-one carpet cleaning powder detergent that can also be used on wet-cleanable upholstery and furnishings. This effective cleaning detergent contains self neutralising properties, amazing stain removers and grease digesters. It also contains water and fabric softeners for improved cleaning results. Ultimate Master carpet cleaning powder is formulated with a special blend of surfactant agents that change the surface tension of the fibre to quickly dissolve and emulsify soiling. You can use Ultimate Master as a pre-spray but simply mixing 10g of the carpet cleaning powder with 5lt of warm water in a sprayer and spray over the area you would like to clean. 5lt could approximately cover 600 sq ft of carpet with average soiling. Agitate the solution with a carpet pile brush, such as the Grandi Brush, and leave to dwell for 10 minutes. When used in the solution tank of your hot water extraction machine, Ultimate Master can be used as an extraction cleaner and also as a rinsing agent. Ultimate Master is self neutralising reducing the risk of colour bleeding and resoiling, it also eliminates the use of additional Anti-Foams and Acidic Rinses under normal usage. Ultimate Master is a safe to use product but you should follow the usage guidelines. As with all professional-cleaning chemicals it should be kept under the complete control of competent technician at all times. Do not swallow, inhale, or ingest. Avoid prolonged skin contact Avoid eye contact. Use in a well ventilated room (this will also help drying times). Do not allow customers (inc children or pets) to use the cleaned items until fully dry (or 24 hours). Allow adequate ventilation for drying. And of course keep out of reach of children at all times. 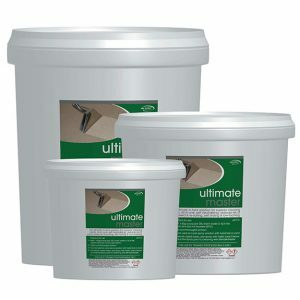 Ultimate Master Carpet Cleaning Powder is available in 4Kg, 10Kg and 20Kg. You can order on-line HERE by clicking THIS LINK.